Jer 18:2-4 Arise, and go down to the potter’s house, and there I will cause thee to hear my words. Then I went down to the potter’s house, and, behold, he wrought a work on the wheels. 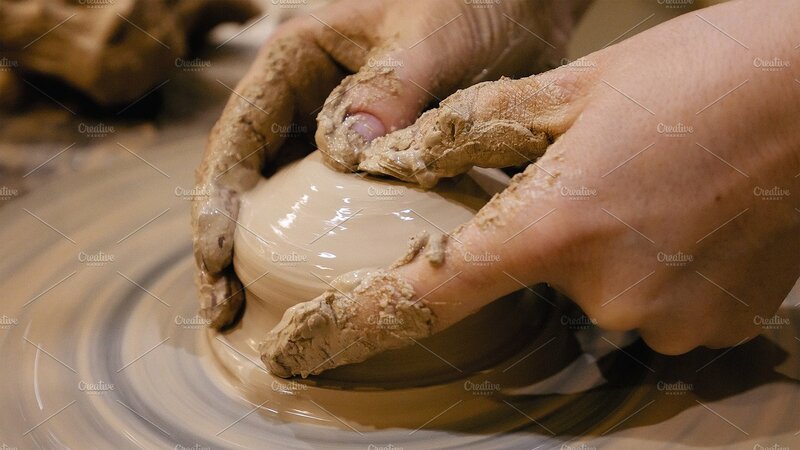 And the vessel that he made of clay was marred in the hand of the potter: so he made it again another vessel, as seemed good to the potter to make it. Will you arise and go down to the Potters house? Will you come to the Father and place yourself in His hand? Will you allow yourself to be marred and to be ruined for this world? Can you abandon yourself to His wheel and allow Him to create in you what He will? He will not compel you . He bids you come to Him with the fullness of your life, holding nothing back and allow Him to mar you, to ruin you. Will you step forward and open up your heart and allow the King of Glory to come in all of His fullness? We come to the Lord as pieces of clay drawn from the earth. He takes us and He rearranges us. Who we once were is crushed and broken and reshaped on the potter’s wheel. Upon the potter’s wheel we are the clay. We are in His hands and there is a process. How wild it is that we, the clay, would ever question the potter? Every part of who we are as genuine saints is shaped and molded by the potter and it is all in His hands. The steps of our lives are ordered of God. We are His. Do you think saint that this fiery trial that you are going through is out-with the bounds of the potter’s wheel ? It is not. So if you are tempted this day to question the Lord about the circumstances of your life, know that every part of your life has purpose. It is never pleasant to be thrown down upon the wheel, to be taken in His hand and crushed, to be pounded and molded into something entirely new and useful for the potters own purpose. And even then we have to consider that the firing is yet to come. The furnace into which we are placed that hardens us and makes us strong. Yet those who yield to the potters hand is in the end shaped into something marvelous. I want to encourage you today saint. There is purpose in your suffering. You are being shaped into a vessel entirely useful to your Lord. Will the dammed up power of God be loosed? What would you do if your house was on fire? What would you do if your loved one was diagnosed with a terminal illness? Would you simply go about your business as usual? Or, would the pressing circumstances cause you to focus on the emergency at hand? Is it not true that when you are faced with a great calamity that your typical routine is dramatically interrupted? Do you hear what he is saying, the pent-up power of Godly people, which for too long has been restrained, had broken loose. Now, who is doing the restraining? The general thought at the time is that things could never go back to how they had been. Never again could the one man system be allowed to restrain the Holy Spirit from speaking through His people and releasing a dam of power that can shake communities and nations and indeed the world. Yet all too soon the moment was gone and the silenced ministers took back the reigns of power and the Godly people, the Royal priesthood was once again silenced. The opening paragraph asked the question “what would you do if your house was on fire?” Do you know that the vast majority of people killed in house fires are killed because they are sleeping? They simply never wake up, they are overcome by the smoke in the atmosphere. They breathe in what is all around them and they die. The second question asked what would you do if your loved one was diagnosed with a terminal illness? Many people do not even realize they are dying. In that case there are no opportunities to put away the normal typical routine. It is in the vested interest of the Devil himself to keep people asleep. If he can keep them asleep, if he can keep them from realizing their condition then he will much more easily be able to go about his business which is of course to destroy the church and the people of God. Can you see the condition of the church? Is it apparent to you that the power of God is being restrained by silencing the royal priesthood? The foundations of righteousness are being destroyed and the power that could be brought to bear is being silenced by our routines and systems. If we truly believed that we are being surrounded by gross darkness and the enemy is coming in like a flood then we would raise up the standard of the Word of God that never changes and allow the power of God to be released just as it was in the Welsh revival. Sadly, most are asleep and they refuse to be woken. Pride is a powerful anesthetic. It allows the blind to remain blind and those who are at ease in Zion to remain at ease. Those in Jerusalem believed that nothing could ever happen to them because that city housed the temple. Jesus knew otherwise. The trappings and position of ministry cause those in ministry to be at ease. Tozer said that it is very difficult to persuade a man of something when his very livelihood depends upon him not getting it. It is the clergy that causes the word of God to be restrained and anointed words go unspoken and are dammed up inside the priest. When that which restrains is taken out-of-the-way, steps aside, then God moves with power. Only repentance and turning from our wicked ways can change this. The Body of Christ needs to be edified and all the more so as that day approaches. God has clearly laid down in the Word how the Body of Christ is to be edified. Will we humble ourselves and turn from our wicked ways? It remains to be seen. Is Jesus not enough? And the sad fact is that for many He is not. Can we worship the Lord Jesus and Him alone despite any outward circumstances? Many will gladly follow the Lord Jesus to the mountaintop, how many will follow Him to the cross? So many desire His blessings but not many are interested in His sufferings. We desire to feast but we shy away from the fast. We want to be clothed in garments of righteousness and beauty but we dont want to appear to this world in what they perceive to be rags. The riches of Christ, the depths of His glory are found oftentimes in the darkness of our circumstances. The treasure is found buried in the field. The field is the word of God, Christ made flesh, and who among us will give our all to attain this field and then set about to dig, to excavate to mine? Is not the honey found within the honeycomb? The Lord has laid down the terms to purchase this field. It requires our lives and our whole hearts. He breathed out life and His soldiers all inhaled. There are Christians who are immature and always will be. They are Christians who are tossed to and fro like a wave on the ocean, running from one thing to the other, and then oftentimes back to the same thing, Christians who are continually circling around the mountain but never making any upward progress. There are believers who take two steps forward then meet a serious obstacle and take three steps back. This of course, is the narrow path. Many are called to this path, but few there are who find it. Only by the Spirit of God can one remain on this path. You will recognize the saint who walks this path, who has walked through fire and flood. He or she does not speak with thee’s or thou’s nor in pious tones that keeps others away with their aloofness. The saint who has been tried by God is eminently approachable and much more interested in others than him or herself. The saint who has surrendered to the broken process is like a sweet aroma, full of love and forgiveness for they are all too aware of how much they are loved and have been forgiven themselves. Heb 5:8 “Though he were a Son, yet learned he obedience by the things which he suffered.” What has suffering taught you saint? Have you learned to be more obedient? Are you closer to the Lord than when you first began? Have you traveled deeper into the heart of God? A mature saint is a beautiful thing for he or she reflects the light of the Lord into a dark and broken world. If you could see your Christian life as a graph from beginning to now, would the line have a general trend upwards? It should. The thrust of our life should be Christlike, this is our reasonable service as servants of the most High God. It’s never too late for the saint to learn or surrender to the learning process. And no matter what stage we are at in our walk with the Lord we must always be learning and delving ever deeper into the “knowledge,” of the truth. This is not a head knowledge but rather it is an intimate intertwining of our hearts with His which leave us more and more like Jesus. Tozer rightfully identifies the loneliness of the walk of the saint who has stepped behind the veil so to speak. Certainly it has always been this way. Yet in these days this loneliness the saint feels, this isolation that plagues him can only get worse. For part of this loneliness has always been associated with separation down through corridors of time. In every age every group of saints has faced the challenge of their time and they faced it, for the most part alone or in smaller groups. Now why do I say that it can only get worse? I believe that it will only get worse because this world is growing darker, darker than it ever has been before. There is coming a time such as has not been before. Before it is all over right will have become wrong, day will have become night and every saint who has walked in the garden of the Lord’s heart will be more isolated that any group of saints ever have been in the past. Can I suggest that when a saint is compelled deeper into the heart of God then that is a deep blessing. Yes in the natural sense of the Body of Christ we yearn for fellowship, deep genuine fellowship. Yet there is a an even more powerful force that grips us. This force lies at the center of who we are. If we were to drill into the center of who we are we would find this here. If we could see with spiritual eyes into the deepest parts of who we are we would see this. What is it? Its a gift that we received upon which everything stands. It is the Truth and our love for it. It is such a serious thing is it not, the truth? By it we stand or fall. Those who receive the love of the truth are saved, those who do not, perish. Now, if you have received the love of the truth, nothing will compel you to give it up. You have received it as a gift from God Himself and it burns in your bones. This is why there is more loneliness ahead in this world for the saint. For the world and indeed much of Christendom has turned its back on the truth. They are willing to trade the truth for the love of man and the acceptance of the world. We know that perfect love casts out all fear. This love, which we saints have received will do its perfect work. It will keep us in power and give us a mind that is not shaken by circumstances, a heart and a mind that stands upon the unshakable Word of God. Yet not just the Word of God but the dynamic reality of the presence of God. And that is the separation. Only in like-minded saints can we ever find fellowship. Only that kind of fellowship moving forward will be acceptable. The reality is that there is an ever-widening gap between those who call themselves followers of Jesus and those who, as Tozer would put it, have seen as opposed to heard. On the road to Emmaeus two saints said ““Were not our hearts burning within us while he talked with us on the road and opened the Scriptures to us?” The Holy Spirit opens up the Word to His saints as they encounter the living God in their hearts. He leads them and He guides them and at the bottom of it all is Truth and the saints love for it. What is Truth? Jesus is Truth and in that Truth He give us life and that more abundantly and He shows us the way. If that way leads us down the dark and narrow road of circumstances and loneliness, then that will not stop us from going down that road. And so the gap indeed widens for the genuine saint who has received the love of the truth. The world and all of its ways have forced itself into Christendom and demands allegiance. Not total allegiance to begin with for that old serpent is far too wise for that. 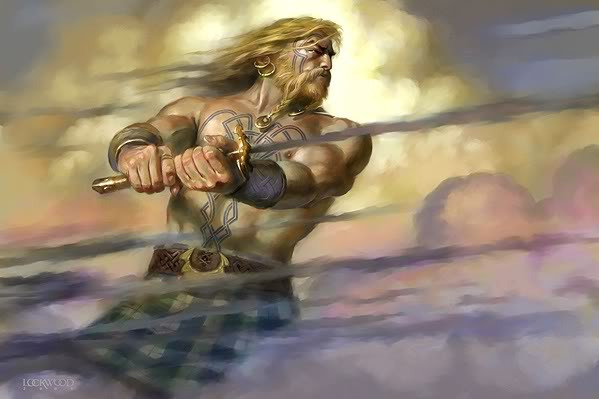 Just a foothold, juts a little foothold that’s all, today, but tomorrow comes the stronghold and then the stronghold becomes the base from which total dominance of all the land becomes a reality. The genuine saint flees away from all of that and will find less and less places of refuge until at last he has no where else to run. Yet the man or the woman of God has found a hiding place that can never be conquered or taken. It is the high tower of the Living God. It is the shadow underneath the wing of the most high. It is the secret garden of the heart of promise given to us. There we walk saints. It is a place where we know. It is common to us. I have met saints from all over the world who ” know,” this place. And my spirit witnesses with theirs and theirs with mine. Before this dark old world is finished with us saints we will have gathered there as the reality of this present world comes. There are but two worlds, two realities. This world and the Kingdom of God. When the Lord returns, which world will He find us in? Each world is exclusive and demands total loyalty. We are witnessing the stripping away of all of the pretense of this world. There is more stripping to come as the master of this world exposes himself for who and what he is. And antidote to this world and the father of lies is the Truth and our love for it. Let us stand fast in the coming days and follow the passion of our hearts no matter where it leads us. God the Father was so deeply wounded by Calvary. He was not asking His son to suffer and He stand dispassionately by. How did God the Father suffer?? At the height of Calvary He watched His precious Son take all of our sins and crucify them for us and turned His head away. Yet He heard His Son cry out “My God, My God, why has thou forsaken me.” God the Father was wounded so deeply that our minds are simply too small to even come close to understanding. Perhaps only a parent who has watched their child suffer or die in agony can even come close to imagining the pain? And we know at that very moment, ” The veil of the temple was torn in two from top to bottom.” What does the veil represent? It represents the covering of Gods heart, His chest if you like. When the sacrifice was complete, that which had been hidden from men in general, was revealed, the heart of God. God chose to show His presence to the world through His Son Jesus. So, through the wounds of Jesus, and the wounds of the Father, we are united into His presence and can walk in the power that flows from His presence. The Lord revealed this to me many years ago. He took my mind back to when my son, who was two at the time, was burned over 60% of his body with third degree burns. In the first few days he almost died. Part of his life saving treatment was to take him, every day for days at the hospital, and force him into a salt bath. I can still hear his screams. I was asked to help and aid the nurses in this. To hold down your son, whom you love with all your heart, almost killed me, I was only 20 but my hair stared to fall out. He could not possibly understand what I was doing was to save his life, all he knew was that his father, who was supposed to protect him, was torturing him. Years later the Lord asked me to think back about this. And our heavenly Father shared with me how much pain it caused Him to watch His Son be mocked and ridiculed, tortured and killed. In this revelation, I was amazed that God the Father loved us so much that He allowed this to happen for our sake. If we mere mortals can feel emotional pain that is agonizing beyond words, what kind of pain can our heavenly Father feel who is the author and creator of all emotions. And yet, For God so loved the world that He gave His only Son…………………it is above what our minds can comprehend, this love of the Father. A famous man once said that some men hate their enemies more than they love their children. How many cultures have we seen ruined by hate and revenge and unforgiveness. Yet, a spiritual revolution begins in the heart of one man who chooses to forgive his enemies, and yes, even more than that, love his enemies. This is not natural, it is supernatural. Father forgive them for they know not what they do!! Hold not this to their account. For God so loved the world……..while they were yet in their sin. Oh, the love of God is so much higher than we, so much wider than the widest ocean and deeper than the great depths of time and space. It is outside of the natural man, beyond his grasp or even his vain imagination, but when Jesus by the power of the Holy Spirit takes up residence in our hearts and souls and minds suddenly that which was so beyond us is now in us and through us, like rivers of flowing waters flowing out to a thirsty people, to dry and thirsty land. Glory to God we can know the height and the depth of His great glory as we journey deeper into the Father’s heart. Forgive someone today and start a revolution!!! When our primary focus is on anything other than Jesus we become distracted and begin to distance ourselves from the Lord. The deception comes when our focus is on something that is laudable. Things like holiness and revival are a couple of examples of things that in and of themselves are not harmful if they are a by-product of our focus on Jesus. If they are our primary focus then they simply become a tool in the enemy’s hand that leads us away from the presence of God. Only as Jesus is lifted up, only as He is glorified, only as He is worshiped can there be change. He is the central focus of our lives and as we make Him the center of all things only then can we expect to see Him move in power. Everything else, and I mean everything, is religion and vanity. Many a good man has been drawn away from Jesus by focusing on the by-product and not the primary object. This is the essence of religious activity as opposed to the presence and power of God. The work of the Holy Spirit, first and foremost, is to magnify Jesus in the hearts of men. There is life in the rushing waters. It is a strange paradox that we Christians must find Jesus but keep on seeking Him. We must find forgiveness but keep on seeking to forgive. We must find mercy but keep seeking to be merciful. We must read His word but continue to abide in His word. We must find life in Him yet continue to seek life in Him. Like a rushing spring time river we must be ever flowing. And the source of the waters of that river is the Lord Himself. And when we do these things, when we abide and when we pursue, when we keep abiding and keep pursuing then the river keeps flowing and everything the river touches brings life. Rushing waters bring life and in stagnant waters there is death. Will you live today and will that life that is in you bring life to others around you? This is the will of God. The Lords saints are His evergreen trees. When Paul was in the dungeon, by faith he was able to see the glory. When Stephen was being stoned, by faith He was able to see the glory. When the Hebrew children were in the midst of the fire, by faith they were able to see the glory. When Daniel was in the lion’s den, by faith he was able to see the glory. Being able to see the glory of God is a delivering force. The power of this force will shake buildings to its foundations and open prison doors. In the midst of death it will produce visions so that one is engulfed in life. In the midst of fire it will protect you from the flames. When danger is all around you it will keep the lions at bay. In a desert it will be a cloud by day and a fire by night. When your back is to the ocean, it will create a path before you for your deliverance. When danger surrounds you and fear threatens to overwhelm you, it will give you power and love and a sound mind. The glory of God is a dwelling place, it is a tabernacle, a place of meeting for where the Lord is, there is the glory. We were made for glory. And the glory that God the Father gave to the Son, the Son gave to us. And the purpose for that glory is that we may be one even as the Father and the Son are one. And when we are one in Him then we are walking in the glory, walking in the light that beckons to those in the darkness to come forth and live. We have been called to behold His glory. To behold means to look upon, to gaze with wide open eyes. It means more that the casual word to see, it means to look at intensely. How intense is your gaze upon the Lord? Do you see His glory? Have you experienced His glory. If you cannot see it nor have ever experienced it, can you then walk in the presence of God and the power of His Glory? You must be able to see the Lord high and lifted up. You must experience His glory if you want to walk in His deliverance, deliverance not only for yourself but for others. Seek out the glory, do not rest until it rests upon you. It is found in Jesus. It is the light of the world. Being found worthy of the enemies attention. Every great relationship with Jesus attracts the enemy. He cannot stand to see someone get close to Jesus and so he comes against that one. He has never learned, not ever, will that the more he comes against this one who has decided to follow Jesus no matter what, the more he drives him deeper into the heart of God. It must be an agonizing dilemma for the evil one, leave him or her alone and she will do great things for the Lord. Come against him/her and she will shine like the brightest star in the darkest sky, so much is the illumination that so many more will see and hear of the glories of God. Is the enemy at your heels today saint? has he come against you over and over again? Victory in Jesus, you have been counted worthy by the enemy as an enemy of his kingdom, you have been counted worthy to suffer for His name sake and you will be counted worthy to rule and to reign with Him throughout eternity. This is the word of God, anything else is the lies of the enemy. Sleep well saint, you are in good company.